I am always on the hunt for a good coffee and Grizzly in The Intermark is my go-to place when running errands. A quick little pick-me-up sets me in high spirits before ticking off one of my least favourite chores – grocery shopping. 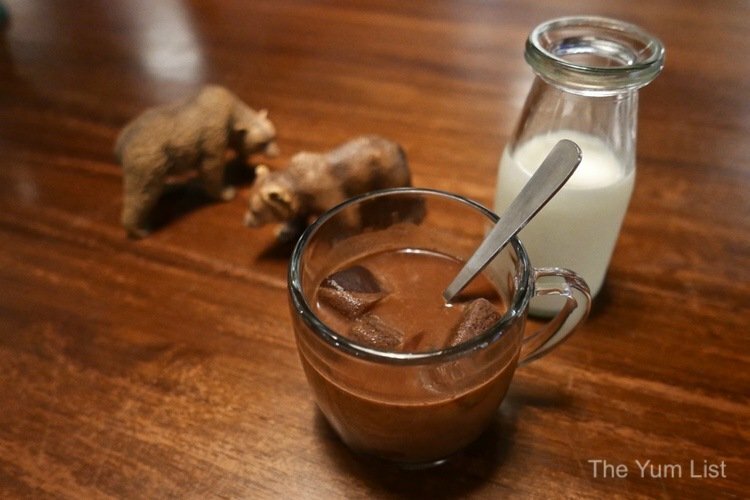 Grizzly offers more than just coffee though; they have a compact food menu too. Today I stay longer than my quick-grab and get a taste of some sandwiches and cake, along with my regular coffee, of course. 90’s grunge is playing when I arrive this morning. Exposed light bulbs, a life-size grizzly statue and timber tables and chairs compose a warm feel. 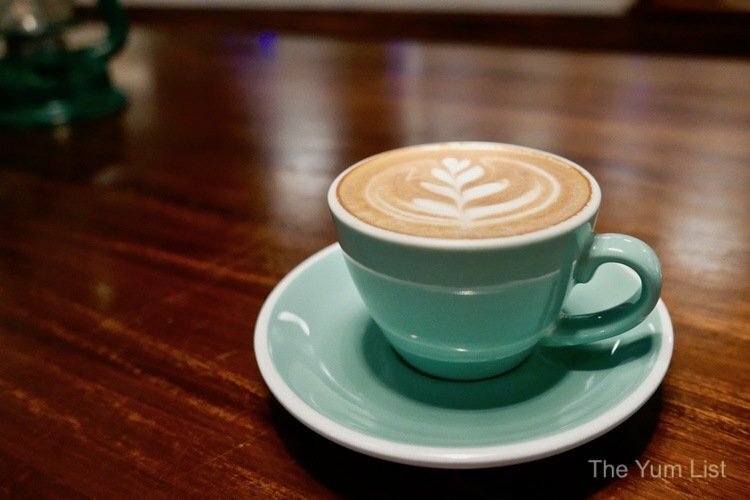 It’s reminiscent of a hip café in a cooler climate. There is a steady stream of customers flowing in and out for a takeaway cup and a number of folks also taking a few minutes to dine in enjoying a light brekkie and moment of composure before work. 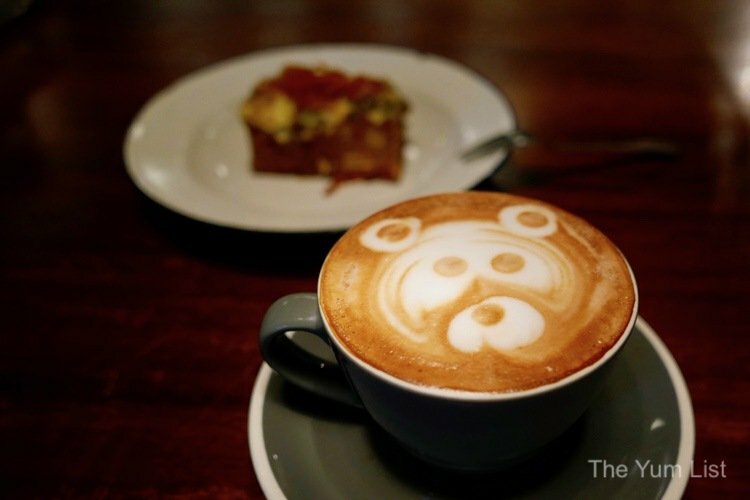 Surprising fact: Grizzly is under the same umbrella as the well-established, bright and cheery Marmalade Café in Bangsar. I never would have guessed. Manager Q tells me that Grizzly represents the “bear cave”. Their goal is to turn possibly grumpy bankers, office workers and so on into happy campers. With tin plates and some of their drinks (such as the Mochatella) served in cups with handles, an oil lamp and miniature grizzlies as décor, I see how easily the comforting feel of sitting around a campfire is emanated. Priorities straight, coffee is the first order and a good strong Latte (RM11) elevates my mood. Nicely textured foam and just-the-right-temperature milk over their very own espresso blend is well-balanced. It’s an international mixture of medium-roasted Costa Rican, Sumatran and Ethiopian beans. Low-fat milk is available for those wanting to reduce the calories. Dessert for breakfast? Why not? Mochatella (RM18) starts with a Nutella base. Espresso ice cubes are added and then guests add milk (provided on the side) to their own preference. I recommend not stirring at first. Taste and then gradually stir building sweetness as desired. The food menu is kept simple for their small prep area and the items make quick and easy bites to eat in with coffee or to grab and go. Close to two handfuls of toasties, a couple of pies and a small selection of cookies, muffins and cakes just about sum it up. I’m a big fan of a toastie, so am easily pleased here. 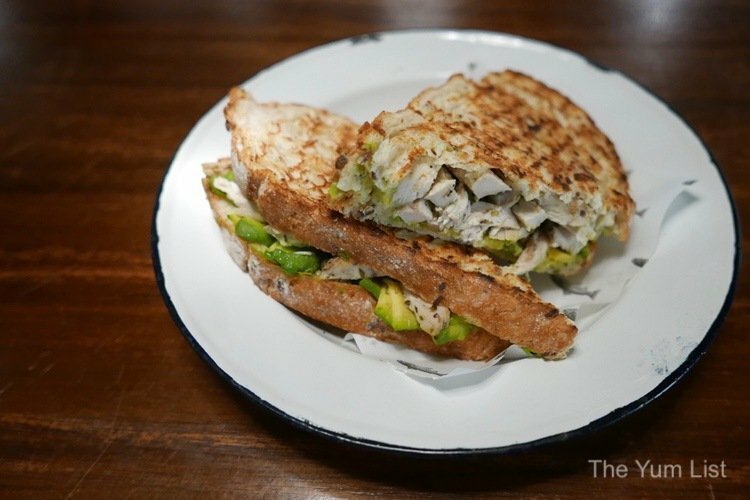 First off, Grilled Chicken Avocado Toastie (RM18) is given a liveliness with wasabi mayo. This is their most-ordered item and I can see why with the thread of heat tempered with the creamy avocado. Bread is toasted until golden furnishing an elegantly crunchy exterior while maintaining a soft spongy middle. 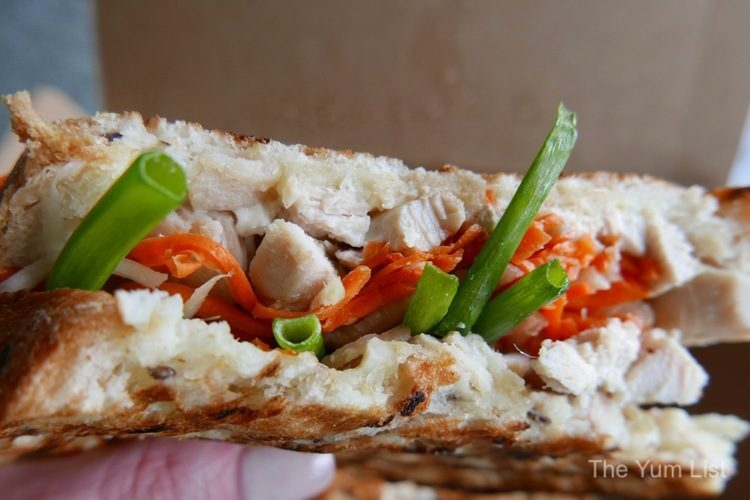 Bringing a taste of Vietnam to Grizzly, the Lemongrass Chicken Bahn Mi (RM16) features the traditional filling of chicken breast marinated in lemongrass served with shredded carrots, daikon and spring onions. Of all the sandwiches, this one has the lightest profile. Q shares that this is his favourite. Smashed Avo and Eggs Toastie (RM15 normal RM10 petit) offers something for breakfast. I love that there is an option of petit – it’s great for a small bite or for those who like to try a few different things. The filling is an egg salad with the avocado and boiled eggs mashed together. A lightly grained (crusty cereal) sourdough is a good thickness, holding the generous filling but not making the sandwich “all bread”. 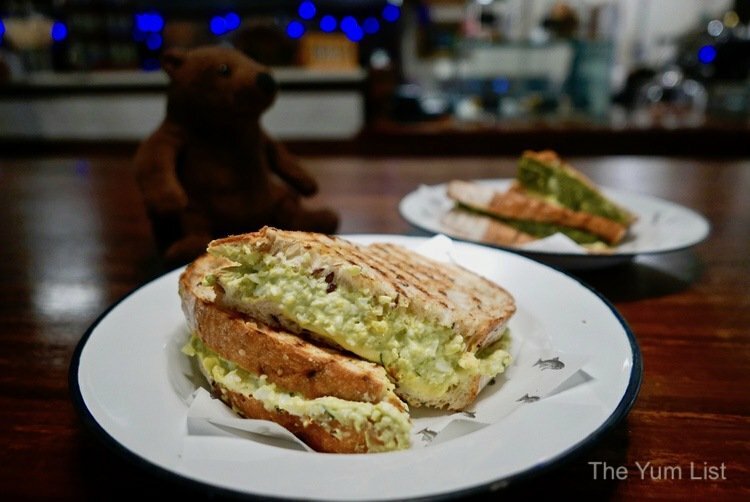 Another brekkie option, Green Eggs Toastie (RM15 normal, RM10 petit) is given its verdant hue with a pesto omelette. The bread bulges with egg and cheese. The cheese is melted through giving that seductive texture associated with melty cheese. It really is a hearty portion. Light eaters might be satisfied with the petit serving of this alone as the wadding is so liberal. Carrot Cake (RM10) is a happy choice for me on most days. Knowing it comes from the Marmalade kitchen is a good predictor that it’s going to be yum. 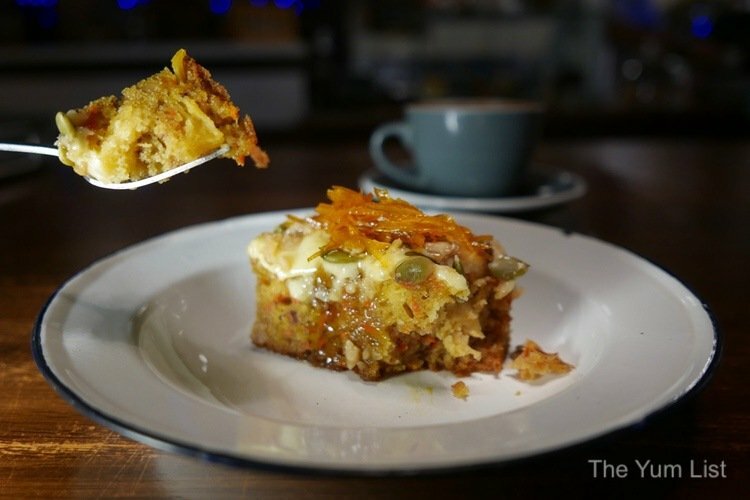 A moist cube of cake textured with shreds of veg is covered by a thin layer of cream cheese. The star though is the seductive top of crushed walnuts, pumpkin seeds and a scoop of orange marmalade on the crown. 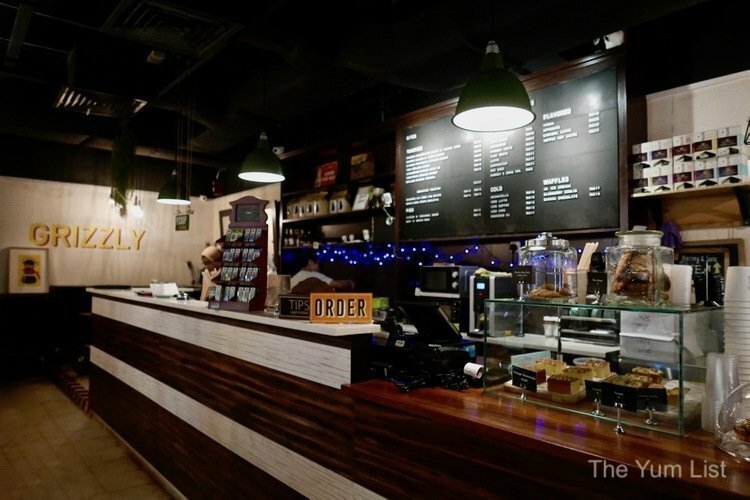 Grizzly café at The Intermark is a cosy and friendly spot to grab a cup of coffee. A small menu of toasties and sweet bites are easy grabbing for a quick snack before work or as a respite in between chores. Reasons to visit Grizzly, The Intermark: warm cosy setting; well-balanced espresso-based coffee; toasties. More on KL’s cafe scene here. 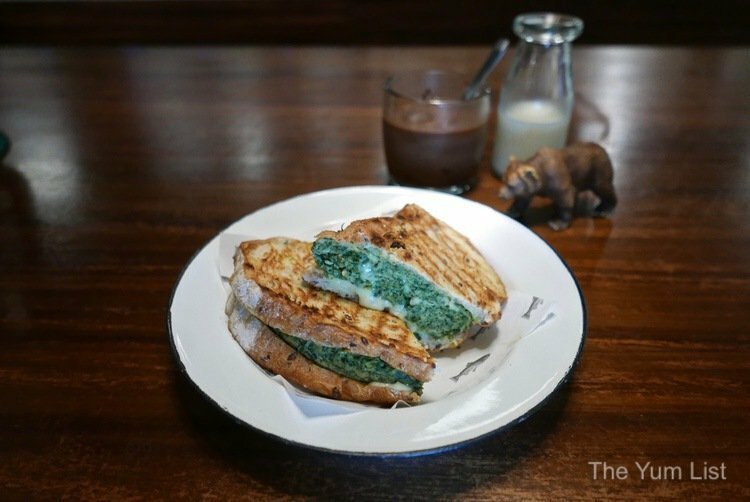 As much as the name isn’t as tempting, I am waiting to try that Green Eggs Toastie! All entrees all sound and look healthy. Bravado sure goes good in lot of items. Lemon grass chicken sandwich and carrot cake will be my choice.